[Episcopal News Service – Aurora, Illinois] Linda Barber is not an immigration lawyer, but she knows one if you need one. She’s not a priest or a deacon and doesn’t prefer the title minister either, though Jubilee minister is her official title at Trinity Episcopal Church in this city west of Chicago. What Barber has become over more than 30 years of service is an improbable immigration law expert and the humble one-woman team behind Trinity Amnesty Center, a ministry that has provided a guiding hand to more than 1,000 newly minted U.S. citizens and helped an untold number of other immigrants and their families with everything from paperwork to preparing for their naturalization tests. 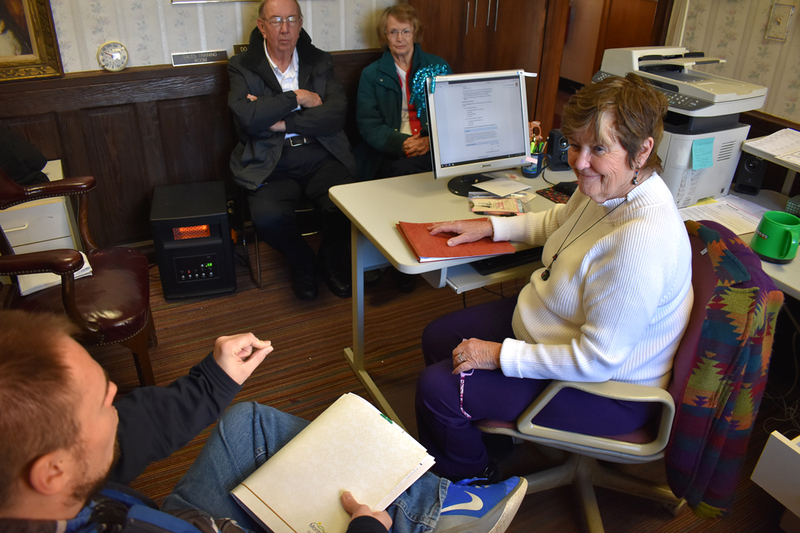 “If you need your fingerprints, I can do them right now,” Barber, 75, said from behind her desk at the church office. In Barber’s office, the only judgment you are likely to face is on the merits of your immigration case. Either you have a case, or you don’t. And if you do, Barber is your devoted ally through every step of the process. “Welcome the stranger” is how Barber describes the Christian purpose behind Trinity Amnesty Center. 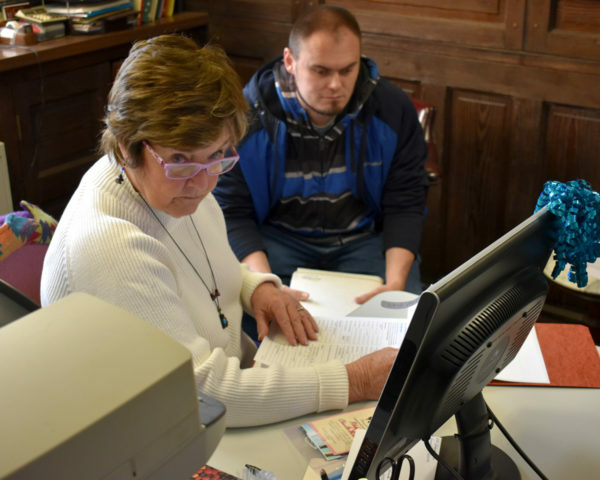 Immigration assistance is just one of the ministries Trinity Episcopal Church offers as a Jubilee Center of the Episcopal Church since 1987. Trinity recently received a $750 Jubilee Ministries grant as a show of support for those efforts, which include a weekly soup kitchen meal, opportunities for court-ordered community service and a work program for individuals with developmental disabilities. That level of activity may surprise anyone who only visits Trinity on Sunday morning, when the average attendance at worship services barely tops 30 people, mostly skewing older, according to Barber. She is a lifelong member of the congregation who was baptized at the church. “We do a lot, for the small group that we have,” she said. Pinned to a bulletin board above Barber’s desk is a certificate of appreciation awarded her by the Diocese of Chicago in recognition of her immigration assistance. The certificate is from 1988, when Barber was still relatively new to this work. She jokingly curses the church’s former rector for being absent one day in 1987, leaving Barber, as parish administrator at the time, to answer a knock at the door from the immigrant who would become her first client. It was a Canadian woman who hadn’t realized she wasn’t a U.S. citizen until she needed to verify her status in order to apply to a college in Chicago. Or was it that the woman was about to get married? Barber struggled to summon a precise memory of that first case, but its legacy is clear. Now 31 years later, Barber gladly opens the door of the church offices to welcome anyone looking for help with his or her own immigration status or a relative’s case. Aurora is Illinois’ second-largest city at about 200,000 residents, about 50,000 of them foreign-born, mostly from Latin America and Asia. Its downtown suffered an economic decline toward the end of the last century, but there are signs of growth again, said the Rev. Denzil Luckritz, Trinity’s rector since 2015. The Jubilee Center has had a hand in that rebound, Luckritz said, thanks in large part to Barber’s work. “She’s made a difference in people’s lives,” he said. 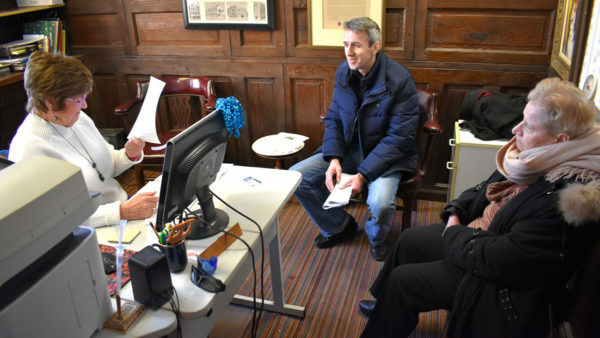 On the day Episcopal News Service visited Barber’s office, she had a 10 a.m. appointment with Charlie Whitney, a 30-year-old from the nearby city of Ottawa, Illinois, who was applying to bring his fiancée to the United States from the Philippines. “What have you got for me? Do you have the form?” Barber asked Whitney. “I do,” he said, handing her a stack of paperwork bound neatly together. This was a Form I-129F, a “petition for alien fiancée,” and it dutifully provided information about how Whitney met 28-year-old Rhea Tago while vacationing in the Philippines in 2017, how they fell in love and kept in constant long-distance communication, and how he returned to the country and proposed to her in January. Barber typically scans a form like this for potential red flags that she thinks immigration authorities, looking to identify marriage fraud, will use as reasons for denying legal residency. Whitney’s documentation was thorough, including screenshots of some of his love-struck Facebook Messenger conversations with Tago. “I’m impressed. You have done your homework,” Barber said. She told him his next step is to be patient. She also advised that money orders and cashier’s checks are processed faster than personal checks. Whitney asked if security concerns have slowed down the process, but Barber said she wasn’t aware of any that would affect this petition. If all goes smoothly, Tago might be able to join Whitney in a matter of months, Barber said. The priest at Whitney’s Roman Catholic parish already had agreed to marry the couple within three months of Tago’s arrival, as required by immigration law. “If we’ve got the rest of our lives together, what’s another couple months, if needed?” Whitney asked. He gave Barber a $20 bill as a donation for her help. Barber is a part-time paid employee of the church and typically works Wednesdays and Thursdays. Some weeks no one stops by needing immigration help. Other times her clients visit after learning about her services while attending the free lunches she helps organize on Thursdays. She also gets referrals, as was the case with Whitney. His grandmother had struck up a conversation with Barber while the two women were working together on floral arrangements for an Aurora flower shop on Valentine’s Day. Add part-time florist to her resume. She’s also a bass drum player in a local steel drum band and officiates at swim and diving meets, activities that got her out of the house 25 years ago after her daughter left home for college. Her work with the Trinity Amnesty Center did the same. The term “amnesty” may be a political lightning rod in 2018, but the ministry’s roots date back to the Reagan era, when passage of the bipartisan Immigration Reform and Control Act in 1986 created an amnesty program for millions of immigrants. That initially drove some of Barber’s first clients to seek her help with their paperwork. She responded by learning everything she could about immigration law and is still visibly energized by the work. “I’ve met so many people from all over the world, and from some countries I didn’t even know existed,” she said. Barber still regularly attends classes offered by the U.S. Citizenship and Immigration Services, or USCIS, office in Chicago, to stay up to date on the latest changes in the law. Back in Aurora, she maintains a modest library of immigration resources in her office. One cabinet in the corner is stocked with brochures on civics lessons for the naturalization test. She also has flash cards if clients want to practice. Lined up on a shelf behind her are copies of “Welcome to the United States: A Guide for New Immigrants.” And if she needs to verify a detail, she’ll either pull up the Department of Homeland Security website on her computer or grab a green binder with “USCIS” written on its spine and flip through page after page of forms, fee schedules and instructions. Barber says she knows more about immigration law than some lawyers – less a boast than a statement of fact – but if she’s unable to answer a client’s questions or thinks legal assistance is necessary, she hands the case off to an Aurora attorney, Patrick Kinnally, who has worked with Trinity Amnesty Center nearly from the start. Most of the cases Barber sees involve Form N-400 (application for U.S. citizenship) or Form I-130 (green card application for the direct relative of a U.S. citizen or legal resident). She has attended more than her share of citizenship ceremonies, and a quick check of her computer records shows at least 1,084 people are U.S. citizens today thanks partly to Trinity Amnesty Center. Some stories stick with her, like the man with Down’s syndrome whom she taught to write “I want to be a U.S. citizen” over and over. She accompanied him on his trip to Chicago for his naturalization interview and remembers him pointing to the Statue of Liberty in a picture on the wall. “It still chokes me up,” she said. He is now a citizen. Another client asked Barber to help bring her parents to the U.S. When the parents became citizens, Barber helped them apply to bring their other children. And when one of those children got married, Barber was invited to the wedding. Her “right way” evokes a federal process, one that ensures immigrants maintain legal status. The wrong way, whatever it may be, has no corresponding form in the green binder. The process of bringing family members to the United States has been criticized by President Donald Trump as “chain migration,” which he hopes to end. Does Barber see anything wrong with immigrants bringing their whole families to the U.S.? Barber paused at the question, then admitted she hadn’t really thought about the prudence of the policy. Another legal path to citizenship is known as the diversity visa lottery, which encourages immigration from certain countries underrepresented among the 1 million or so people who legally move to the U.S. each year. That, too, has been targeted by Trump: “We need to get rid of the lottery program as soon as possible,” he said in November. Goran Petkoski, a native of Macedonia, came to the U.S. in 2002 with a diversity visa. His English is precise despite his lingering accent, and his enthusiasm for America was obvious during a visit to Barber’s office. “It’s not just that you can accomplish all of your dreams, a better life. I learned the fact that we have the best education,” said Petkoski, who earned a bachelor’s degree in finance from Northern Illinois University in 2016 and now is training to be a grocery store manager. Petkoski, 41, became a U.S. citizen in 2007 and later applied to bring his mother, Spasija Petkoska, to this country with him. 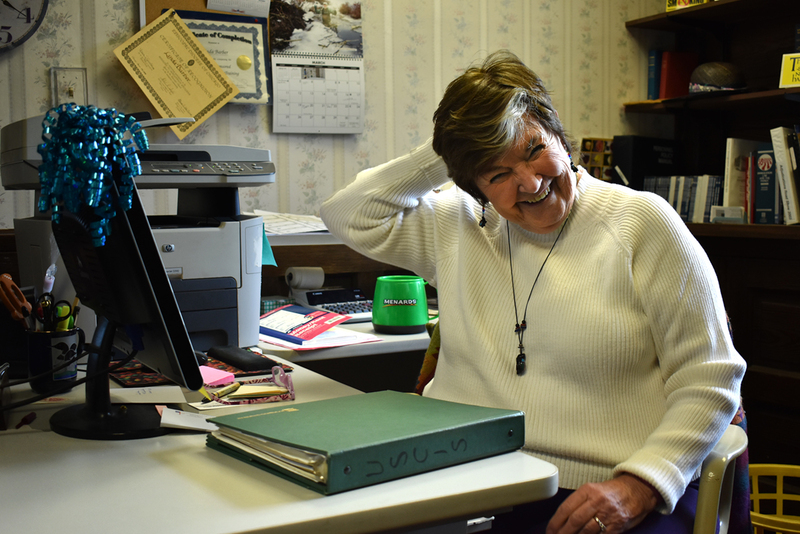 She moved here in 2012 and now sat in the chair across from Barber’s desk, her hands folded in her lap. Her grasp of English was minimal, but Petkoska, 61, has been a permanent resident of the U.S. for more than five years, making her eligible to apply for citizenship. “Why do you want to become an American citizen?” Barber asked. Petkoska’s son translated for her. “She wants to be a citizen because she lives here, and she respects everything that the country does for her,” he said. Barber outlined what to expect: At her citizenship interview, Petkoska will need to explain in at least simple terms what it means to be a U.S. citizen. But before then, she will need to get two passport-style photos, and she will need money, because the government charges $725 for the application alone. During their next visit, Barber will help them fill out Form N-400. “I’ve helped a lot of people from Macedonia,” she said before sending mother and son on their way. Barber has not had much experience with the Deferred Action for Childhood Arrivals program, or DACA, which was created under President Barack Obama to offer protection for immigrants who came to the U.S. illegally when they were children. DACA protections now are in limbo after Trump revoked the program. As for adults who came to the United States illegally, Barber withholds condemnation. 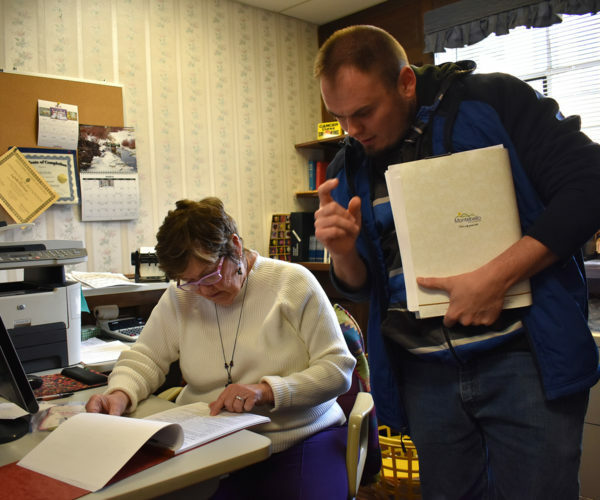 They simply aren’t the clients she typically assists at Trinity Amnesty Center. Under current law, no amount of paperwork is likely to help. “There’s no way they can become legal at this point,” she said. That doesn’t prevent Barber from engaging in some wishful thinking. One of the regulars at the Thursday soup kitchen meal is a man who has struggled to resolve issues with his legal status. Every week, after he finishes his free lunch, he sticks around to help wash dishes. Form N-600: “An adopted child may also acquire U.S. citizenship through his or her adoptive U.S. citizen parent.” A valid path to citizenship, but not for someone 18 or older. Wishes and paperwork aside, Barber also feels called to look after her dishwashing friend and any other immigrants who enter the doors at Trinity Episcopal Church. Linda Barber sets an example for all of us. Sadly, the churches and synagogues as a whole have been silent as ICE conducts cruel separation of families by deporting undocumented people, many of whom have been living honest, wholesome lives, working hard and supporting their families. It was the indifference of a Christian nation, Germany, that allowed the roundup of Jews. To Rev Fenton, You sir are way out of line! Equating the DACA situation to the Nazi Jewish holocaust is extremely offensive. Rev. Fenton, when we read of Congress in 1939 debating whether to give shelter to Jewish kids waiting on a ship in New York harbor, we know the kind of words they used. The opponents spoke of legalities and policies and fears, not of compassion. When we hear the opponents of granting acceptance to DACA members, we hear words of legalities and policies and fears, not of compassion. We know what transpired after 1939. May history not judge us so lacking again. The Reverand spoke to the “roundup of Jews” and that is where I take offense. The St Louis, which actually was bound for Havana, Cuba is an entirely different story without any Nazi roundup.